Performance artist and scholar E. Patrick Johnson's provocative study examines how blackness is appropriated and performed-toward widely divergent ends-both within and outside African American culture. Appropriating Blackness develops from the contention that blackness in the United States is necessarily a politicized identity-avowed and disavowed, attractive and repellent, fixed and malleable. 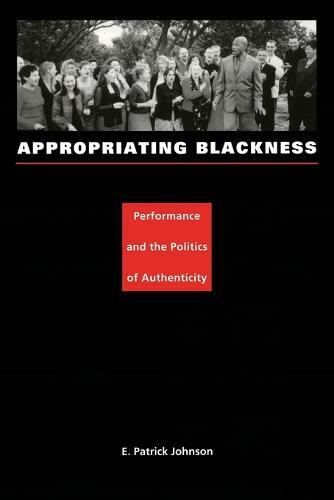 Drawing on performance theory, queer studies, literary analysis, film criticism, and ethnographic fieldwork, Johnson describes how diverse constituencies persistently try to prescribe the boundaries of "authentic" blackness and how performance highlights the futility of such enterprises. Johnson looks at various sites of performed blackness, including Marlon Riggs's influential documentary Black Is . . . Black Ain't and comedic routines by Eddie Murphy, David Alan Grier, and Damon Wayans. He analyzes nationalist writings by Amiri Baraka and Eldridge Cleaver, the vernacular of black gay culture, an oral history of his grandmother's experience as a domestic worker in the South, gospel music as performed by a white Australian choir, and pedagogy in a performance studies classroom. By exploring the divergent aims and effects of these performances-ranging from resisting racism, sexism, and homophobia to excluding sexual dissidents from the black community-Johnson deftly analyzes the multiple significations of blackness and their myriad political implications. His reflexive account considers his own complicity, as ethnographer and teacher, in authenticating narratives of blackness.